When you have a commercial roofing project in Macon, Georgia, and want a company that will take a meticulous approach to the job while still completing it quickly, turn to the experienced team at Arango Insulation. We use outstanding products from top-of-the-line manufacturers, and we have the knowledge and expertise to handle commercial roofing jobs of all types, though we specialize in large-scale, multi-family dwellings, such as condominiums, apartment buildings, and retirement housing complexes. We use highly trained employees who work under the direct supervision of a heavily involved, expert project manager, a process that helps us ensure jobs are done correctly the first time. In the event of a problem, however, you can always count on Arango Insulation to provide expedited service to take care of any issues that may arise, and we back all our work with a one-year warranty. We offer both low slope/flat and steep slope roof systems. Our low slope/flat roof options include TPO, EPDM, and PVC single-ply systems as well as a Bitumen multi-ply system. 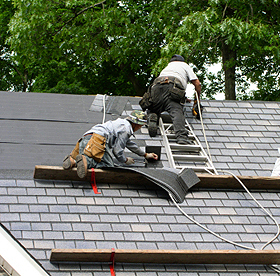 For steep slope systems, we offer asphalt shingle roofs and metal (steel or aluminum) roofs with a Kynar coating. Contact Arango Insulation today for more information on our commercial roofing services in Macon, GA, and the benefits of hiring us as your commercial roofer. Additionally, we provide a wide range of other services for commercial structures, including commercial insulation, waterproofing, fireproofing, and concrete coating.